If you shoot large-caliber firearms often enough and you have a properly functioning nervous system, then you're going to flinch. But the physiology of the flinch can be overcome with mental training, and the best way to do that is to train your body to minimize the effects of recoil by periodically stepping down in caliber to a lighter gun that mimics your big bore. The concept that works for pistol shooting also holds true for rifles and shotguns. The top shooters in every field, whether it's defensive pistol, sporting clays or long range rifle, can benefit from a training gun, and flinching is certainly not the only problem these light guns can remedy. Training guns make it easier to diagnose and fix a host of problems including poor trigger control, improper sight picture, no follow through and more. If you're serious about becoming the best shooter that you can be, then a training gun is going to help. Today, a number of companies offer rimfire training guns that mimic their larger guns, and many of these are relatively inexpensive. Good shooting requires good technique, and that technique comes from lots of practice. Oftentimes, it's a whole lot easier on you and your wallet to get that practice using a training gun, and it's one of the best ways to transition new shooters into the sport. Most of us can't afford to shoot thousands of rounds of defensive ammunition or large-caliber magnums, but rimfire ammunition offers a low-cost alternative that helps reinforce the same basic principles that apply to more powerful guns. If you can't find rimfire ammo, then you may consider dry-fire or laser training practice. Here are six reasons you need to think about buying a training gun. With factory ammunition, it can cost more than two dollars every time you pull the trigger on with quality personal defense or hunting ammo. Switch to a training gun, and you'll save lots of money on every shot while still practicing many of the same basic skills you're working on with your big gun. You can also afford to shoot a lot more at every range session, reinforcing your skills without breaking the bank. Plus, .357 SIG or .300 Weatherby Mag. ammo may not be available at your local hardware store. Chances are if that store carries ammunition, they'll have some .22 LR on hand. Just like sinking a putt in golf or hitting a baseball, good shooting requires proper mechanics. It's a whole lot easier to work on the mechanics of shooting if you aren't anticipating a big blow from recoil, seismic muzzle blast or lamenting at how much every shot is costing you. You can build these foundational mechanics with your training gun, and these lessons will carry over to your larger caliber firearms. 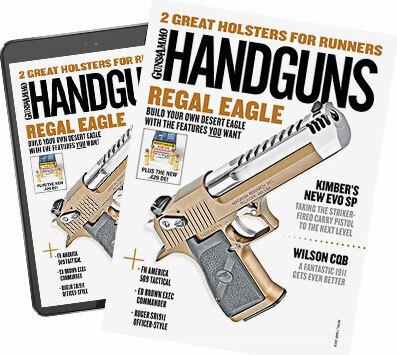 Handgun shooters can practice magazine exchanges for hours with a .22 trainer for the same amount you'd pay to swap out a couple mags on your carry gun. A good mechanical foundation requires many rounds of shooting, and that's easier with a training gun. A long day on the range with a heavy-hitting magnum strains your hands and wrists, and will leave most shooters mentally fatigued from the repetitive pounding. Swap things up and give yourself a mental break. I like to warm up on the range with a .22 LR pistol or bolt-action before switching to more powerful guns to reinforce my mechanics. I test a lot of powerful guns, so believe me when I say that the mild pop of a rimfire after a long session of heavier loads helps refresh you as a shooter. Chances are you'll be able to print nice, tight groups with your rimfire, and you'll feel better at the end of the day. It's harder to disguise obvious technique issues when you're shooting a light-recoiling gun. Most folks find it easy to hide a flinch behind the thunderous report of a .44 Magnum, but that same grip-and-grimace death hold shows up immediately with a .22 caliber. Trigger control is another major problem if you're shooting a big gun, and that can lead to major expansion of groups. If you see that trend starting to develop, swap out your .45 ACP for a lookalike .22 and work on trigger techniques to improve your skills, then go back to your big carry gun and, chances are, you'll start to remedy these shooting ailments in a hurry. There are a host of new guns that pay homage to their larger counterparts, and it's never been easier to find the right training gun for your shooting needs. If you spend all day working with an AR, it's an easy transition to a light-recoiling rimfire like the Smith & Wesson M&P-1522. Guns like the Ruger SR-22, SIG Sauer Mosquito and Kimber Rimfire have controls that align with larger centerfire counterparts from those companies, so you are still using the same mechanics to operate the gun without the heavy cost of ammo and added recoil, and less expensive practice means you'll spend more time on the range. Training guns help new shooters learn the basic function of a firearm and proper technique without being overwhelmed by the roar of larger guns. Having a training gun makes transitioning from a rimfire to a centerfire much simpler, and new shooters can work on technique and develop confidence before switching to larger guns that can be intimidating. This is also true in the shotgun sports, where the hefty thump of a 12- or 20-gauge target gun can interfere with lessons on gun mount, swing, follow through, sight picture and trigger pull. A new shooter that learns on a training gun will be successful more quickly when they switch to larger guns than someone who learns their first lessons with a firearm that scares them.